Diabetes is a metabolic disorder that occurs when the body is unable to properly regulate its blood glucose levels. Glucose is a simple sugar that comes from the carbohydrates you eat. Your body synthesizes and stores glucose, and then uses it as a major source of energy. Insulin, a hormone produced in the pancreas, takes the glucose in your blood and transfers it to the cells in your body. 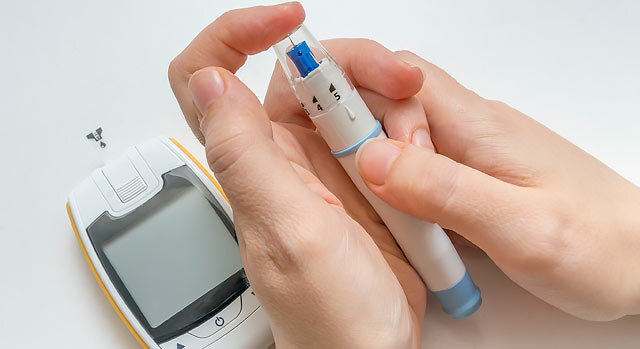 People with Type 1 diabetes, formerly known as juvenile diabetes, have a pancreas that produces little or no insulin, while those with Type 2 diabetes have body cells that do not respond to the insulin their pancreas produces. As a result, glucose can't get into body cells and glucose levels in the blood become elevated. Over time, the high blood sugar levels may damage organs of the body. Certain factors can increase the risk of developing diabetes, particularly Type 2 diabetes. People who have close family members with diabetes, and people who are overweight have a greater chance of developing diabetes. The risk of developing diabetes is greater among some ethnic groups including African-Americans, Latino Americans and Native Americans. Other factors that may increase the risk of diabetes include high blood pressure and hyperlipidemia (elevated cholesterol). Among the signs of high blood sugar are increased thirst and urination, blurred vision, fatigue and weight loss. In some people, elevated blood sugar may lead to recurrent infections, including urinary tract infection, vaginal yeast infection or skin infections. Because many people who have diabetes may go for years without signs, many physicians recommend that all adults over 45 should be tested for diabetes every three years. People who have diabetes are at risk for complications that may affect the eyes, kidneys, nerves and circulatory system. Managing diabetes requires that each patient establish therapy goals including targeting blood sugar range, weight management and dietary and lifestyle changes. Comprehensive treatment of diabetes requires a team approach involving patients and healthcare providers, including endocrinologists, diabetes educators, nutritionists, ophthalmologists and podiatrists. Foot ulcers can be a common and costly complication of diabetes. Left untreated, they can lead to infection, gangrene and lower limb amputation. In fact, diabetes-related amputations account for 51 percent of all amputations in the United States, according to the National Limb Loss Information Center. Most often, foot infections are the result of minor foot trauma and wound-healing failure. Because of poor circulation and nerve damage to the feet, people with diabetes are more likely to develop infections even from a minor foot injury. Fortunately, foot ulcers can easily be prevented through self-examination and proper foot care. People with diabetes should treat their feet with special care. By following some simple foot care tips, people with diabetes can dramatically reduce their risk of amputation and lead healthy, active lives. Check your feet for cuts, sores, blisters or areas of irritation. If you have any concerns, see your podiatrist or internist. Wash and dry your feet, particularly between your toes. Protect your feet from extreme hot and cold temperatures. Trim your nails straight across, and only if you can see well. If you cannot see well or if your toenails are thick or yellowed, have a podiatrist trim them. Do not cut into the corners of your toes. Do not cut corns or calluses. Look at your bare feet at each visit. As a reminder, remove your shoes and socks. Check your feet for sense of feeling and your pulse at least once a year. Show you how to take care of your feet. Diabetic eye disease refers to a group of eye problems that can occur as a complication of diabetes. All of these eye problems can cause severe vision loss or even blindness. The most common form of diabetic eye disease is diabetic retinopathy. Diabetic retinopathy is a leading cause of blindness in adults and nearly half of people with diabetes will develop some degree of this disease during their lifetime. It is caused by changes in the blood vessels of the retina that can lead to blindness. If you have diabetes, you should have your eyes examined at least once a year. Your eyes should be dilated during the exam so that your ophthalmologist can more clearly see the insides of the eye to detect signs of the disease. Diabetic eye disease can be treated. Your ophthalmologist may suggest laser eye surgery, which has been proven to reduce the risk of severe vision loss.